A finalized uniform dress code policy was distributed at Monday’s Muskegon Heights Public School Academy board meeting. 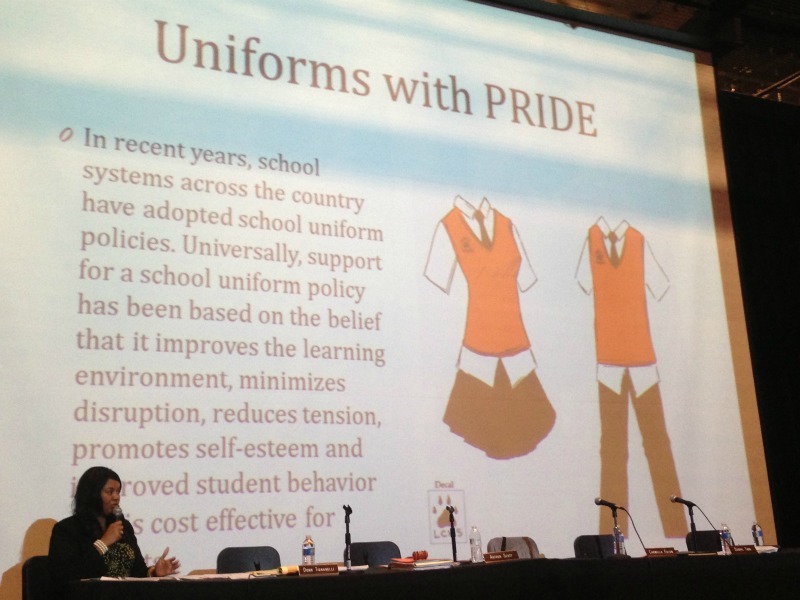 The plan to introduce uniforms to the high school received a year delay due to parent protest in summer and fall of 2012. A dress code already exists for grades K-8. High School principal Carla Turner-Laws shared details of the dress code at Monday’s meeting. Initial concepts and pricing were presented at last month’s board meeting, and high school administration displayed the uniforms at a parent meeting on May 30, 2013. Boys and girls can wear black twill, cotton, corduroy or linen pants, but no jeans or athletic pants. Shorts for both boys and girls must be of “Bermuda” length or longer. Pants and shorts have to be worn at the waist and cannot sag. Shirts for both boys and girls can be black or white, and can be turtlenecks, polos, or oxford-style. Girls have the option of wearing black, non-denim skirts, skorts or capris, but must wear appropriate leggings with skirts. Boys and girls can wear black, white or orange shoes, either of the athletic style or casual style, defined as resembling Rockport or Timberland-style designs. No high-top, sandals, or open-toed shoes can be worn. Socks must be worn. White, black and orange sweaters may be worn, but not hooded sweatshirts. No hats may be worn in the high school building. Shirts and sweaters must be embroidered or screen printed with a Muskegon Heights Public School Academy logo, which can be applied by several local vendors, according to last month’s meeting. Turner-Laws noted that when a group of students saw the uniform options, many opted for the oxford shirt with tie. Violation of the dress code can lead to a written notice delivered to a parent or guardian; force a change of clothing, or other consequences. When a public comment asked what would happen with families who could not afford student uniforms, board president Arthur Scott said that next month’s meeting would included more details on those cases. A printed version of the uniform policy will be mailed out with report cards next week, including this past year’s eighth graders. Vendor details should be included with the report card, as well, because the next school year starts in about 2 months. Following up the uniform discussion, Zachery-Ross also urged parents to enroll or re-enroll their students sooner rather than later. This would allow them to get moving on uniform purchases sooner. She also said it would better allow the Academy’s staff to estimate staffing requirements before the last minute, which she said happened last year. 2012-2013 enrollment numbers stood at 1,194 students by end of year, according to Zachery-Ross.